In Tempe Arizona there is a really cool coffee shop where they roast their own beans in house. 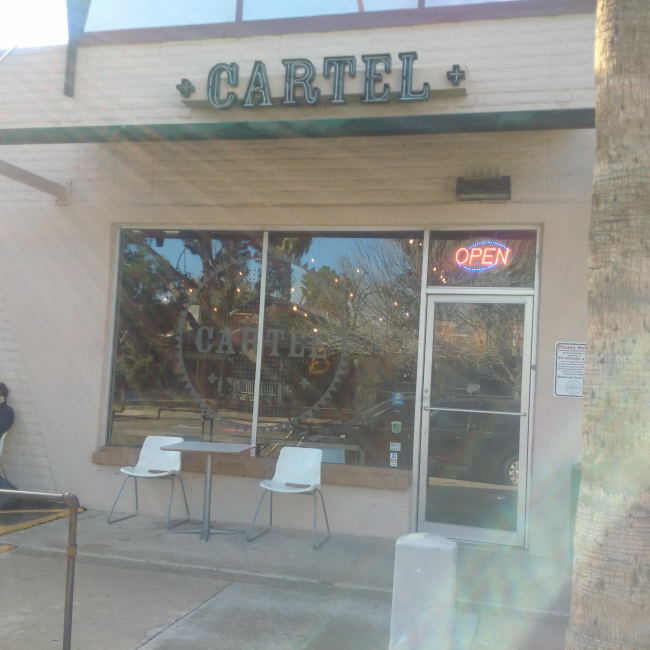 The Coffee shop is called Cartel Coffee Lab. Most coffee shops would be very happy with being just a great coffee shop but not these guys. They also have a small nano brewery in house! The coffee shop itself is pretty funky with the roasters off to the side so you can see the process. There is a ton of seating and very helpful staff. I wish I had taken more photos of the coffee shop side but I don’t drink coffee so at the time I just didn’t think of it. The side I really cared about though was the brewery side and the lounge on that side. The brew system looks like a really high end home brew system in the back with some tanks tucked in the other corner of the lounge. I was quite impressed with the quality of beer that was being produced out of this coffee shop and I really think someone in Vancouver needs to look into doing this! If you head to the Tempe (Phoenix) area in Arizona make sure to check out this coffee shop and brewery or one of their satellite locations around the state. You will not be disappointed in the beer or the coffee! This entry was posted in Beer Travel, Brewery and tagged arizona, beer, brewery, cartel coffee, cartel coffee lab, coffee, coffee roaster, craft beer, tempe.